Thursday marked a new era for Nintendo as they announced their new gaming console ‘The Nintendo Switch’. Gamers of the Nerd kind pulled receipts from all over the internet and we have everything you need to know. Nintendo published a three-minute video that offered an overview of what people can expect from the platform including the fact that it’s a console/handheld hybrid that uses cartridges. The Switch sits in a “Nintendo Switch Dock” that connects it to a TV. You can then lift the system out of the dock and it will “instantly” transition into a portable mode. The detachable controllers that sit on either side of the Nintendo Switch are called “Joy-Con” controllers. You can attach the Joy-Con controllers onto the system itself or a “Grip” accessory, “mirroring a more traditional controller,” Nintendo said. Alternatively, they can be used wirelessly. “One player can use a Joy-Con controller in each hand; two players can each take one; or multiple Joy-Con can be employed by numerous people for a variety of gameplay options,” Nintendo said in a press release. Nintendo also shared a list of some of the publishers, developers, and middleware partners that are working with Nintendo on the Switch, including some of the biggest players in gaming like Activision, Bethesda, Bandai Namco, Electronic Arts, Ubisoft, Take-Two, Konami, and Warner Bros. 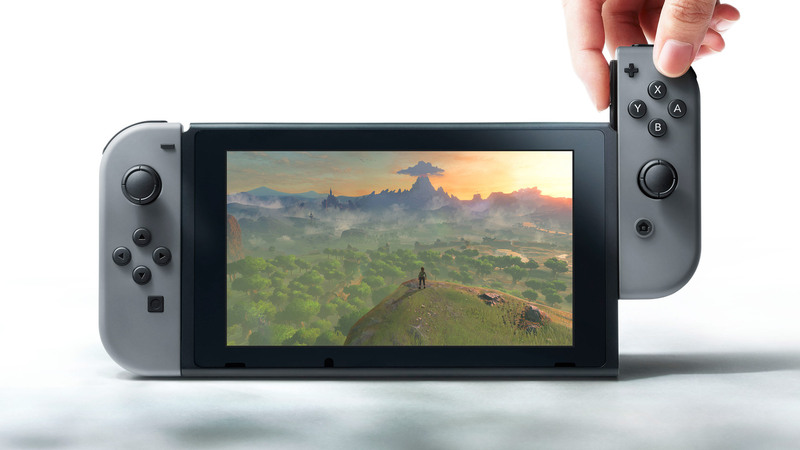 The full specs–or a battery life estimate–for the Nintendo Switch have not been announced.